2012-13 saw the rise and fall of overvalued 3D printing stocks, as bullish hype reversed into a bearish correction. Fortunately for us, the resulting fear commenced a sell-off of all companies associated with 3D Printing – including those with justified valuations. 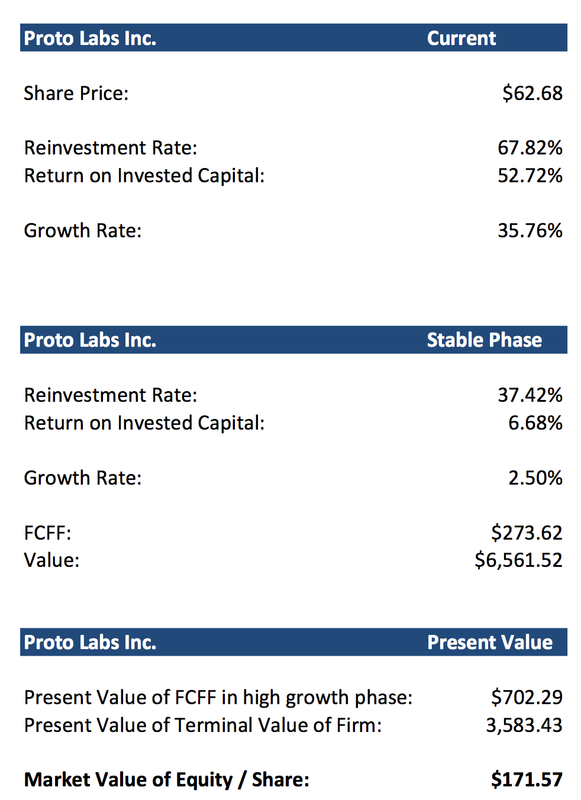 One such company is Proto Labs Inc. (PRLB) – a niche market manufacturing company that utilizes 3D Printing (amongst other) technology. Specifically, the company specializes in manufacturing prototypes and custom made parts. Caught in the crossfire, the company’s shares have seen a 35% decline in value. Within 6 months, the company went from the high of $90, to a low of $58. PRLB’s ‘clumping’ with traditional 3D Printing companies has left it far below intrinsic value, with huge upside potential over the long term. PRLB consists of four operational segments, three of which relate to its manufacturing operations and one devoted to research and development. Each of these segments is suited to a different stage of the manufacturing process, creating synergy throughout the development chain and within the business model. Firstcut uses computer numerically controlled (CNC) machining to manufacture small quantities of prototypes, fixtures, jigs or custom projects from blocks of plastic or metal. Firstcut offers the speed of additive rapid prototyping but without the limitations in material selection or surface finishes. PRLB’s Firstcut service produces the minority of its revenues, with an annualized average of 26.19% over the last three years. However, it does play an important role in the growth of the company, averaging 50.95% in annualized growth over the last four years. Protomold is the company’s main revenue driver. This business segment manufactures custom parts in low- and mid-volume, using a selection of thermoplastic resins and metals. Injection molding has been responsible for most of the company’s tremendous growth over the years, averaging an annualized growth rate of 31.82% over the past three years. The business segment accounts for majority of the company’s revenues, averaging 73.81% of annualized total revenue. On April 24, 2014, PRLB successfully launched its additive manufacturing service, through the acquisition of FineLine Prototyping, Inc. Additive Manufacturing utilizes stereolithography, selective laser sintering, direct metal laser sintering and 3D printing technology to produce parts requiring high-precision geometries. The acquisition of FineLine was a smart play by PRLB’s management, due to the synergy it has with the company’s current manufacturing services. According to PRLB management, 70% of their customers utilize additive manufacturing in their development process. Until now, the inability of PRLB to provide customers with additive manufacturing has served as a significant loss of potential revenue. As an investor, I am extremely optimistic regarding this acquisition. Why? Simple. PRLB has been sitting on and accumulating a lot of cash, which was earning a low (yet, fair) market return. Also, the company is earning tremendously above its CoC, with a ROIC of 52.72%. This indicates that management has proven to be extremely competent in their investment decisions and is generating excellent returns on those investments. That idle cash will now be put to far better use and earning a significantly higher return for shareholders. Protoworks is the company’s research and development segment. This is the business segment that has successfully differentiated PRLB from competitors, through innovation of software and manufacturing processes. Once again, the effectiveness with which PRLB’s management has positioned the company for future growth is evident. The company’s return on investments in RD has proven to be indispensable to its success thus far, as it will continue to be in the future. Unlike many other companies, this has been RD well spent. So what differentiates PRLB from its competitors? Speed and software. The company could justifiably be described as a software company, rather than a manufacturing company. Much of its machinery functions using its proprietary software, which is developed and employed internally. Also, the company’s automated online platform serves developers’ needs instantly, allowing them to upload design schematics and automatically quoting them on price and specifications. This automated and highly efficient process allows developers to have their parts developed to specifications and shipped within a day of submitting an order. There are plenty of similar companies to PRLB but none of them can match the effectiveness and efficiency that comes with its superior software development. This reliability and speed is invaluable to early-stage product developers. All of PRLB’s proprietary software is patented within the United States and Internationally, preventing imitators from encroaching profits. PRLB’s past inability to offer additive manufacturing to its customer-base exposed an integral flaw in the company’s ability to maintain consumer captivity. 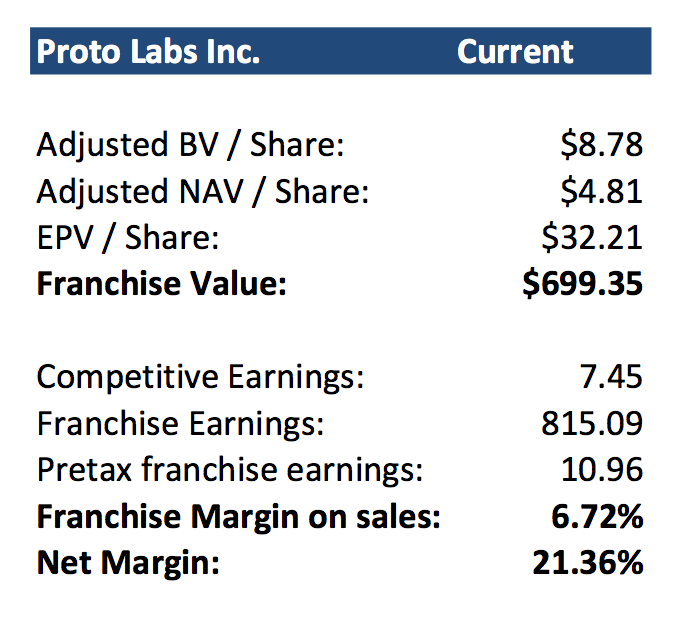 As mentioned above, 70% of PRLB customers were utilizing additive manufacturing from competitors, as PRLB themselves did not offer the service. In a business where speed is of the utmost importance for customers, this served as a significant weakness in the company’s competitive advantage. Fortunately, PRLB management seemed to be aware of this, utilizing some of their significant cash reserves to acquire FineLine for $38M. With an additive manufacturing service now in place, the company is in an excellent position to leverage a full array of services to its customers. In combination with its unique speed advantages, the company is set to increase its market share within the space, increase competitive advantages and encroach profits from competitors. A franchise analysis of PRLB reveals the existence of a valuable franchise with significant competitive advantages. Management is effectively utilizing the firm’s assets in producing a return. PRLB possesses a valuable franchise, which indicates the presence of competitive advantages (which are sustainable based on our previous qualitative analysis). Also, our franchise margin on sales indicates that to justify an EPV / share of $32.21, the firm must possess competitive advantages in the form of higher prices due to consumer captivity, and/or lower costs due to either proprietary technology, or economies of scale equal to 6.72% of revenues. PRLB currently possesses a net margin of 21.36%, indicating that it far exceedingly satisfies its EPV / Share value. Now that we have established that PRLB does indeed have sustainable competitive advantages, we can be confident in making some assumptions regarding its future returns. Plenty of firms witness unsustainably high returns on invested capital during their early growth stages. However, for most firms, by the very nature of sustainable competitive advantages, will be unable to achieve this. In other words, the vast majority of companies will not be able to sustain a ROIC above their CoC. In fact, most companies maintain a ROIC below their CoC and continue fuelling growth that destroys intrinsic value, rather than enhances it. PRLB, however, does possess legal protection (patents) that have an expiry of 14 years. Therefore, there is the implicit assumption that its current competitive advantages will be sustainable for the foreseeable future. The exception to this will be outlined in the risk analysis section below. The fear surrounding the 3D printing industry has led the market to irrationally group this unrelated manufacturing company with overvalued 3D Printing stocks. At its current price of $62.68, PRLB is tremendously below intrinsic value, at a price that does not even remotely justify its cash flows. Using the most up to date figures available (TTM), cash flow analysis reveals that PRLB’s present intrinsic value is $171.57. The growth rate was lowered from 35.76% to 2.5%, which is the growth rate of the economy. A stable company cannot grow faster than the rate of the economy. The return on invested capital was decreased from 52.72% to 6.68%, to reflect market saturation, in the absence of competitive advantages. Even though I do explicitly state that PRLB does have sustainable competitive advantages, I have taken to be extremely (likely, too) conservative here, lowering the ROIC to reflect possible profit encroachment. The present value of PRLB’s future cash flows comes to a market value of equity / share of $171.57. This is not surprising, considering the company’s current tremendous ROIC of 52.72%, with a reinvestment rate of 67.82%. This is clear indication of a competent management that has been doing an excellent job of utilizing its capital to make returns for shareholders. Clearly, the company has had and is poised for further extraordinary growth. Cash flow analysis of the company indicates a current upside potential of 173%. Using the most up to date figures available (TTM), present earnings power analysis reveals a present intrinsic value of $32.12 for PRLB. In other words, this is the intrinsic value of the firm purely from a present-day perspective. However, as we know, the value of any asset is the present value of the expected cash flows from that asset. Indeed, it would be even more advantageous if PRLB was below its present intrinsic value, but that is rare and usually occurs only after catastrophic events. However, when taking the growth figure into account, we see that earnings power gives us an intrinsic value of $177.29. Our earnings power value analysis indicates a potential upside of 182%. Our cash flows and earnings power value figures are extremely close to each other. This adds significant credibility to our intrinsic value analysis. However, being familiar with each form of analysis, we would place more weight on the cash flow figure of $171.57 as a specific target price than the earnings power value figure. Indeed, it seems that PRLB is significantly undervalued and presents huge potential for investors over the long term. 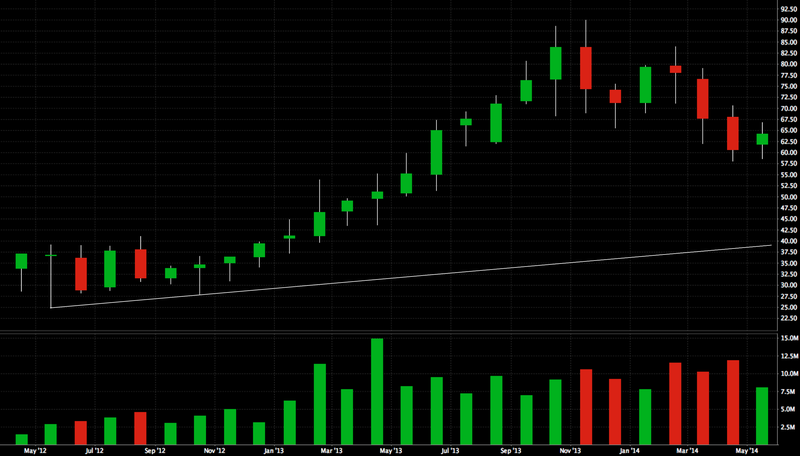 The long-term trend for PRLB is still clearly bullish, in support of our fundamental analysis. (Image taken from InteractiveBrokers trading platform). However, it seems that short-term momentum is heavily bearish, going against the long-term bullish trend. Evidently, the current bearish momentum of PRLB is most likely a temporary one. In fact, we can see that price has been reacting to areas of high demand (unfulfilled buy orders) on the way down. Currently, the price seems to have reacted to the demand area below. With an intrinsic value of $171.57 and a current price of $62.68, there is a margin of safety of 173% until our target price. In the short term, there is a risk that price could very well continue downwards. As a value investor, however, a security so heavily undervalued and with such a tremendous margin of safety makes it far worth the risk. The marginal benefit from waiting slightly to *possibly* get in at a better price is not worth the marginal risk of missing out on the trade. PRLB is a niche market manufacturer, which specializes in low- and mid-volume parts for product developers. The fact that it operates within a niche market, combined with its currently patented technology, makes it likely that it will maintain local dominance of the market for the duration of its patents (14 years). However, competitors are unlikely to idly standby, waiting for patents to expire. There is a possibility that in the future, its competitors could overtake PRLB through research and development, innovating superior forms of production. This would result in PRLB losing market share to competitors, leading to a decrease in overall performance. Therefore, it is imperative to the maintenance of its competitive advantages that PRLB continues to diligently innovate and effectively utilize RD. PRLB is a tremendously well run company, both from a quantitative and qualitative standpoint. The company has been unjustifiably clumped with overvalued 3D printing stocks and sold-off just as fiercely. 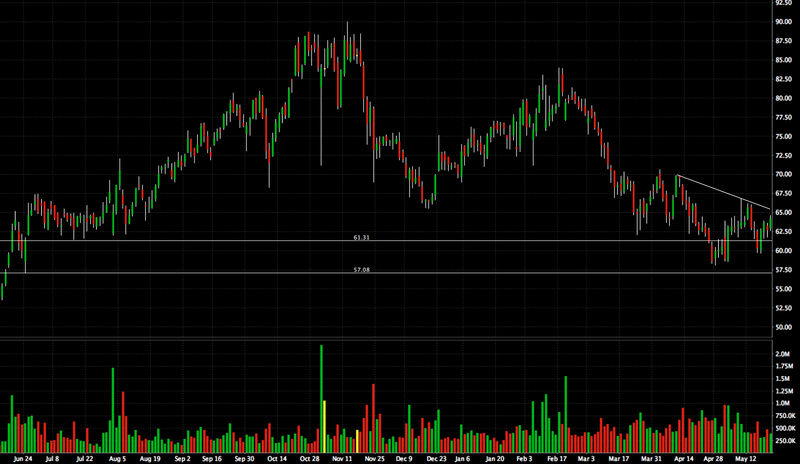 At $62.68, the share price is currently far below intrinsic value, with huge upside potential over the long term. The company possesses sustainable competitive advantages that will position it well for future growth and expansion.